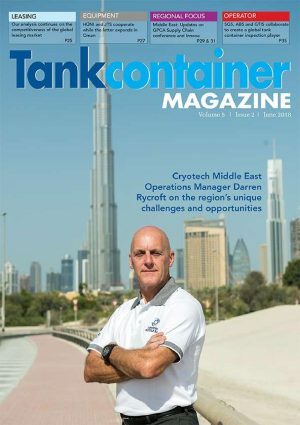 TCM:What assets and servicesdoes Cryotech Middle East offer? DR: Cryotech Middle East (CTME)offers clients safe and secure storage for empty gas and cryogenic tank containers with easy access to and from Jebel Ali in the United Arab Emirates (UAE),the Middle East’s largest port. Weare located in Dubai Investment Park II. CTME’s services include the periodic testing of tank containers aligned with third party testing agencies, welding and fabrication work, vacuum services and general repair work. We also have a first-class paint booth where we carry out anything from general touch-up work to the full repainting of tank containers. Another valuable asset is our bodyshop and repair centre. As an approved insurance repair centre, we have state-of-the-art equipment for undertaking chassis straightening and alignment repairs. There are a large number of roll-over accident vehicles that pass through our workshop and which need to be re-shelled,repaired and re-painted. A highly skilled workforce carries out all the mechanical, electrical and fabrication work required to get these vehicles back on the road. We also have a contract to build, refurbish and repair aviation re-fuelling vehicles, both for civil and military operations. The skill sets required for this work - and the stringent safety requirements that have to be met- means we are constantly under inspection in order to maintain the required standards in this industry.